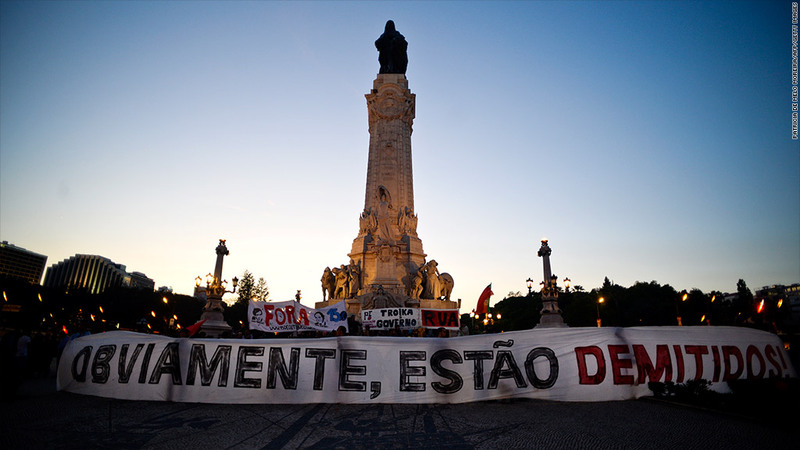 Portugal's political crisis is contributing to new concern about Europe's economic stability. Prime Minister Pedro Passos Coelho has refused to accept the resignation of his foreign minister, who heads a junior partner in the center-right coalition. But anxious investors sold stocks and bonds heavily Wednesday on fears that the government may collapse. Portuguese media said two other ministers could follow their party leader in tendering their resignation Wednesday. New elections could delay economic reforms and prolong Portugal's dependence on bailout funds. Yields on its 10-year government bonds surged above 7% for the first time this year and at one stage hit 8%. Shares on the country's benchmark stock index fell by about 5.5%, with banks particularly hard hit. Major European stock markets and government bonds in other peripheral eurozone states also suffered losses. "We think the risk is that the combination of such higher yields and political uncertainty reduces the prospect of Portugal regaining full market access in the next year, and hence leads to expectations of a new 'full' [bailout] program being required," noted Bank of America Merrill Lynch in a research report. Portugal signed up for a 78-billion euro bailout from the European Union and International Monetary Fund in 2011, and was hoping to exit the program in mid-2014. Its economy has paid a heavy price for the spending cuts and structural reforms demanded in return for the rescue loans. Gross domestic product is forecast to shrink by 2.3% in 2013, a third consecutive year of recession, and unemployment has hit a record high of close to 18%. The government has found it increasingly difficult to meet the terms of its bailout -- some measures have been struck down by the constitutional court -- and Portugal was given extra time earlier this year to hit EU budget deficit rules. Any further backsliding by Portugal could encourage other bailed-out states such as Greece and Cyprus to seek concessions from lenders as they struggle to meet the conditions. "Portugal has emerged as a new serious risk to the grand political bargain in the eurozone of support from the core and reforms in the periphery," noted Berenberg Bank senior economist Christian Schulz. Greece has until Monday to satisfy officials from the EU and IMF that its reforms are on track or risk missing out on its latest tranche of rescue cash. On Monday, Eurozone finance ministers will review a progress report on Greece. EU sources say there are still "a number of outstanding issues" -- such as public sector job losses, privatization receipts and health sector reform -- to be resolved before ministers can allow the tranche to be disbursed. --CNN's Isa Soares and Per Nyberg contributed to this article.